Welcome to the second edition of Coral Sea News for 2018. It’s hard to believe we are only days away from the winter solstice and the half-way point in the year. They say time flies when you’re having fun, and it also flies when you are working with a great group of people to bring a fantastic project to reality! The Foundation has continued its steady growth, the network of people that know about our mission just keeps getting bigger and bigger, and the connections and collaborations we are developing this year are set to deliver some great outcomes, so a huge thank you to everyone that is part of this story. 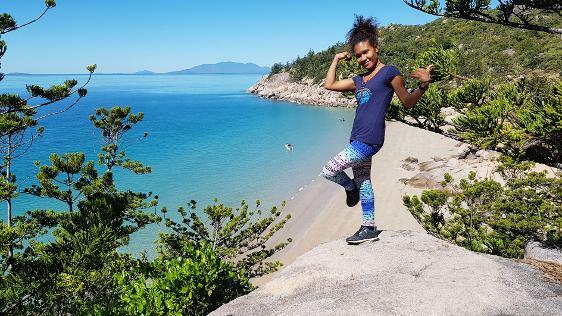 Our PNG trainee student Lorie Pipiga has been here on Magnetic Island for the last two months, continuing her studies of marine parks and environmental sustainability initiatives for developing nations. She was able to meet Foundation team member and marine reserve planning expert Dr Dani Ceccarelli, who gave her a great overview of marine reserve science, and how reserves have been implemented elsewhere in the Pacific. This information will help Lorie communicate the marine reserve concept to the island people in her homeland more effectively in her traditional language. Lorie is also helping us plan the Coral Sea Foundation expedition to her tribal area on Fergusson Island in early August. We will travel 100 nautical miles from Alotau up to Sebatuia Bay in a longboat, and then spend a week on site, meeting with local landowners in the area near Oya Niu reef and the Sanaroa channel to support their wishes to be part of the first marine reserve network in this area. We will also survey some new and potentially very exciting dive sites at Tewala and Sanaroa Island which have not been visited before, so it will be an awesome trip with some great outcomes for reef management and ecotourism in the area. Episode 3 of Coral Sea Visions has some beautiful video and imagery of the land and seascapes from this spectacular part of PNG. Two weeks ago, Lorie and I flew south to meet with secondary school students from Geelong College in Melbourne and Ascham school in Sydney. We spoke to the students about the incredible biodiversity of the reefs around the Coral Sea rim, the threats they are facing, and the work we are doing with our “Sea Women of Melanesia” training program to address the need for marine reserves and the empowerment of women in the developing nations to our north. We lectured to 350 young people in 5 presentations over two days, and it was fantastic to see how interested the students were about the coral reef ecosystem and Lorie’s life in a traditional Melanesian village. Lorie did a great job to overcome her nerves and speak in her second language in front of large audiences, and she was able to impart a strong message to the students that they had a wonderful opportunity to access a quality education that was not available to children of a similar age in PNG. The year 11 girls at Ascham school were particularly moved by Lorie’s story, and she received a standing ovation after her speech, which was one of the highlights of the trip. One student even emailed us after the lecture, saying she wanted to forego her post-graduation holiday, and instead use the money to purchase aid material for PNG and deliver it herself to the area! With feedback like that, we know we are making a positive impression! We both want to take this opportunity to thank all the Foundation donors who made the trip possible, with a special mention to Rhonda Browne from Geelong College and Hazel Watson from Sydney, who facilitated the visits at the schools and looked after us while we were in the big city! Thank you all so much!! Our vision for sustainable development in Melanesia has a strong commitment to improving health and hygiene in the partner villages that develop marine reserves which support our ecotourism activities, and specialist members of our team have a great track record in delivering transformative clean water aid projects in Africa and the South Pacific. We are therefore thrilled to announce a partnership with natural health company Solutions 4 Health, who are Australia’s major distributor of Oil of Oregano. The medicinal benefits of this well-known herb have been known since biblical times, and recent scientific studies have shown the oil has powerful anti-bacterial and anti-fungal properties and can be used in a broad range of applications where modern pharmaceuticals might otherwise be prescribed. Many remote island villages in Melanesia have little or no access to health facilities, or modern drugs, and many people still die from bacterial infections, so a natural antibiotic agent that can be used both internally and externally is likely to improve the health and livelihood of many people. Part of the Solutions 4 Health company philosophy is to support quality community assistance programs in Australia and overseas, and we are very grateful that Managing Director Jim Traiforos has taken an interest in our work in PNG. Solutions 4 Health will be providing the Foundation with supplies of both Oregano oil and capsules which we will deliver to the communities at Fergusson Island during our forthcoming expedition this August.